MALACCA, Friday, 1 July 2011, : Leading the way in realising the "Go Green" mission, Chief Minister Datuk Seri Mohd Ali Rustam cycled two kilometres from his residence in Seri Bendahara to his office in Seri Negeri here yesterday morning. 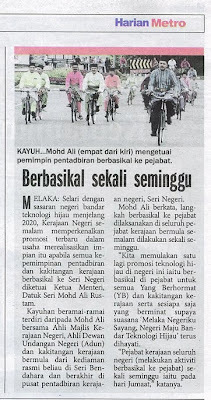 Clad in a green Baju Melayu, Ali was accompanied by some 100 cyclists, including state exco members and heads of government department. 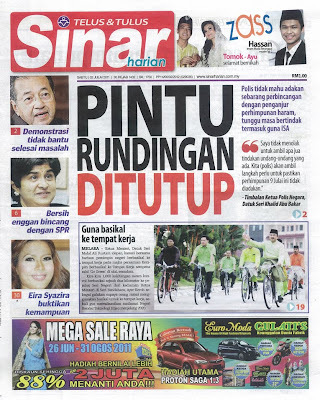 The riders entered the gates of Seri Negeri at 8am and Ali said the event was not a publicity stunt. "I would be cycling to work from home every Friday. This would be my role in educating my employees and the people here on the importance of helping to reduce the emission of poisonous gases from our vehicles." By cycling, we not only protect our environment, but also realise our mission to become a Green Technology City State by 2020. "I would like to call on Malaccans to join me in conserving and protecting the environment in our beloved state. 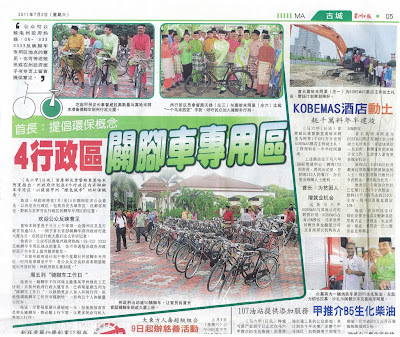 Let us all move in tandem with the government in making Malacca a green technology model state. 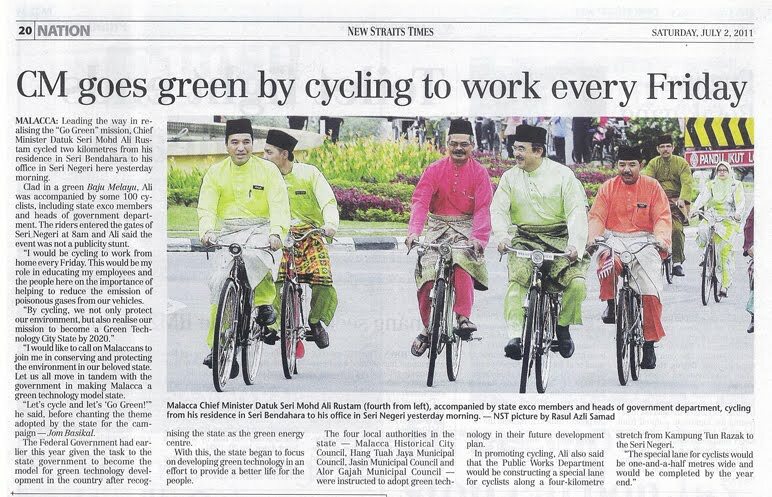 Let's cycle and let's 'Go Green!" he said, before chanting the theme adopted by the state for the campaign -- Jom Basikal. The Federal Government had earlier this year given the task to the state government to become the model for green technology development in the country after recognising the state as the green energy centre. With this, the state began to focus on developing green technology in an effort to provide a better life for the people. The four local authorities in the state -- Malacca Historical City Council, Hang Tuah Jaya Municipal Council, Jasin Municipal Council and Alor Gajah Municipal Council -- were instructed to adopt green technology in their future development plan.